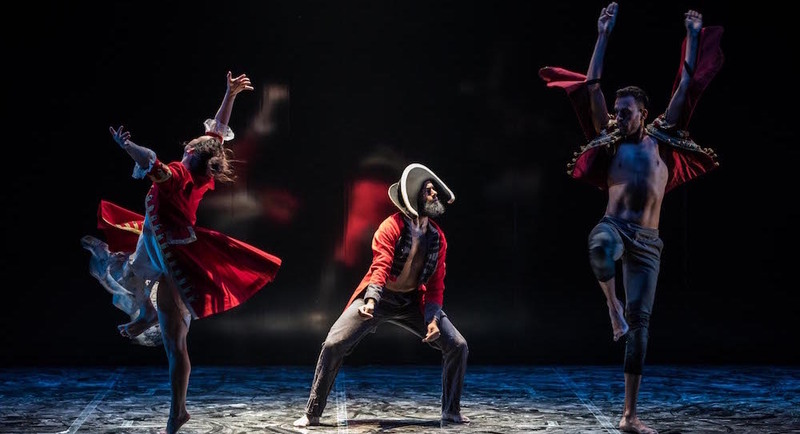 TARA ROBERTSON, BEAU DEAN RILEY SMITH AND KAINE SULTAN-BABIJ IN BANGARRA'S 'BENNELONG'. PHOTO BY VISHAL PANDEY. 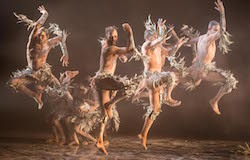 Another visually stunning, sensationally danced work from marvellous Bangarra Dance Theatre, Steven Page’s Bennelong is also disturbing, challenging and packs a huge emotional punch. At the same point on the harbour where Governor Phillip once built him a brick hut, Bennelong returns in this riveting, powerful work. In some ways, it echoes Bangarra’s 2014 production Patyegarang, which is also about first contact with the Eora nation. Bangarra Dance Theatre in ‘Bennelong’. Photo by Vishal Pandey. Bennelong’s story is told in 16 fluid scenes by Page in consultation with dramaturg Alana Valentine. From his birth to his lonely alcoholic death in a relentlessly driven narrative, the themes running throughout the show are impressionistically organised. Virtually kidnapped and forced to be the colony’s ambassador to his people, Bennelong is apparently the first Aboriginal man to learn and write English, acquire European ways and travel to London. Back home, caught between both worlds, he found himself an outsider, never quite accepted by either. He died, ostracised and addicted to alcohol, in 1813. We follow his searing story of uncertain adaptability, disease, survival and culture shock. Steve Francis’ atmospheric, relentlessly driven soundscape combines voiceover, song, music by Haydn, Rule Brittania, old racist sea shanties, additional music and lyrics in language by Matthew Doyle, the sounds of wind, country and sea, and contemporary electronic sound effects in a striking blend of 21st and 18th century. 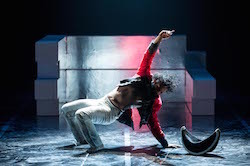 Page’s choreography, trademark “Bangarra”, combines both traditional Aboriginal styles and superbly fluidly danced contemporary (with possible hints of Graham and Murphy). The ensemble work can be quite formal but also an undulating, pulsating sculptural mass. We see first contact, where dancers from both worlds come together in a series of sinuous, rather feline moves, cautiously copying, exploring and observing each other. In another section, the dancers are like startled, awkward kangaroos when they first scent the white invaders, and there’s the striking strangeness of the time Bennelong is dressed for the first time in European clothes, and a growing, chilling horror as the dancers stretch, twist, twitch, writhe and slump from the smallpox epidemic. When Yemmerawanya, who accompanied Bennelong, dies in London, his body is discreetly dragged from the stage on the back of an unsuspecting aristocrat’s long purple cloak, somewhat of a surrealist hallucination.The following “Repatriation” scene is powerful as Yemmerawanya is mourned by Bennelong and dance elder Elma Kris as the Spirit. The set design (by Jacob Nash) is mostly minimalist but extremely effective. Some of it focuses on the use of shiny reflection. There are boomerang designs, a captivating series of‘ “pods” suspended at one point, a hazy ghostly door between two worlds and the rather chilling building blocks of a silver prison cell-like structure at the end that totally enclose him. Mention must also be made of the eye catching suspended opening fiery circle of light and smoke, and later a large abstraction of “1788”. Nick Schlieper’s lighting sensitively blends in with, yet accentuates, the atmosphere of the show. Jennifer Irwin’s stunning costumes are slithery and compellingly textured and seen through aboriginal eyes. At some points, they are fragmented and dreamlike, evocative of the period, including heavy uniforms, elegant 18th dress and assorted fragments (a jacket, a hat). Beau Dean Riley Smith in Bangarra’s ‘Bennelong’. Photo by Vishal Pandey. Bearded Beau Dean Riley Smith, in the eponymous role of Bennelong, is charismatic and intense, in a colossal performance — thrillingly sinuous and supple yet perhaps sculpturally chunky, and it is somewhat obscure as to his motivations, once confronted by the white invaders and whisked to London. Was he a peaceful negotiator, or did he succumb to the surface delights of Western society? Was he a tragic victim of circumstance, a fighter, a father of reconciliation – or all of the above and more? Daniel Riley makes a great impression as Phillip – concerned, weighed down with responsibility and anxious. As Barangaroo, one of Bennelong’s wives, Jasmin Sheppard is striking and powerful. Bennelong is a forceful, extremely moving show of loss and longing, one that resonates strongly now, challenging our ideas of Indigenous life in Australia today and what it might be like in the future.